Fork extensions for forklifts increase the versatility and load-bearing power of the equipment. They allow forklifts and their operators to handle large and odd-shaped loads with better stability with a lower risk of damaging the load. While forklift extensions are essential tools on many worksites, they can present certain safety concerns and safety considerations, which include the stability, capacity, and visibility of the forklift and operator. How Are Fork Extensions Used? Forklift extensions simply slide over the normal forks on a forklift, rest on top of them, and lock into place under a fork hanger. Many fork extensions are made with a welded loop on the end to keep it in place and give workers an easier time putting them on and off. Fork extensions are typically made for hook type forks, which attach to the carriage of the forklift and come in Class 2, Class 3, and Class 4 to accommodate varying carriage heights. Shaft mounted forks attach to a pole on the carriage and are typically specialty forks and custom built. 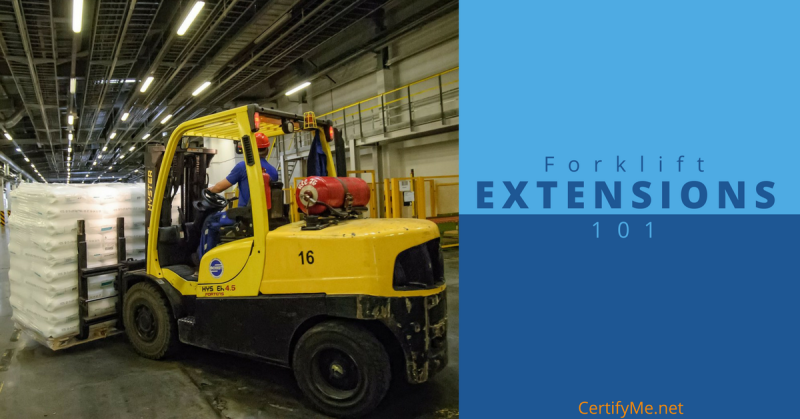 Why Are Forklift Extensions Used? Forklift extensions are used to allow a forklift to expand its load capacity and handle larger, oddly-shaped loads. However, they are best when used for occasional large loads that do not exceed the forklift manufacturer’s load weight limits. When a business handles large loads that are close to the rated capacity on a regular basis, longer forks may be the safer option. However, when used correctly, fork extensions do not automatically extend the load center past the forklift’s ratings, which means they do not automatically increase a forklift’s chances of tipping over. Training and following the manufacturer’s instructions for forklift attachments will help ensure fork extensions are used safely and correctly. Yes, fork extensions are legal, but they come with rules and regulations to prevent accidents. Fork extensions must never be longer than 1.5 times the length of the forks. Fork extensions must be capable of supporting an evenly distributed, or equal load of three times its rated capacity. The rated load center of the fork extension should be at 50% of the fork extension load supporting length. Each fork extension should be clearly stamped and labeled with the individual load rating, supporting fork size, manufacturer’s mark, serial number, year of manufacture, and the required blade cross-section and minimum blade length for the parent fork. If the fork extensions are not factory-installed attachments, employers need to request that the truck is marked to identify the attachments and the approximate weight of the lift truck and attachment combination at maximum elevation with load laterally centered. Modifications or additions that affect the capacity or safety of the forklift shall not be performed without prior written approval from the forklift manufacturer. Capacity, operation, and maintenance instruction plates, tags, or decals must be changed accordingly. The written approval from the forklift manufacturer helps to ensure that the capacities for operating forklifts safety will not be exceeded. Using fork extensions without written approval is in direct violation of OSHA standards. If the forklift manufacturer is unable to provide written approval for whatever reason, employers must receive a written approval from a qualified registered professional engineer. The potential hazards of fork attachments like fork extensions include overloading the forklift when the weight of the attachment decreases the lifting capacity, forklift tip-overs, and falling loads. When the attachment increases the load center by moving the load further away from the balance or fulcrum point, forklifts are more at risk for tipping over and not being able to handle the load. Be careful not to overload the forklift. Ask the forklift manufacturer for the load chart outlining the maximum lift capacities at various load centers. Fork extensions are made for light bulky loads. If the load exceeds the maximum load center, longer forklifts are safer than fork extensions. Fork extensions should be built for the particular width of the fork that is being used. The inside width of the fork extension should not exceed the width of the fork by more than ½’’. Never pick up a load with the tip of the extension. The center of the load must be over the fork and should not exceed 50% of the length of the fork extension. Understand the mechanical limitations of the forklift. Treat an unloaded forklift with fork extensions as partially loaded. Train operators in the fork extension operation and use limitations. Retrain operators if a new attachment is added to a forklift. Inspect forklift extensions every six months. Look for the load-bearing components for deformation, and the load-bearing welds for cracks. According to OSHA, all forklift operators must be trained to use fork attachments safely and properly. If an operator goes untrained, accidents involving the forklift, such as tip-overs and falling loads and crushing hazards are more likely. Operators and nearby workers won’t be prepared to spot potential hazards and remedy them before an injury or fatality takes place. Employers who fail to provide training to operators will be in violation of OSHA regulations and subject to costly fines and legalities. Don’t let a fork attachment become a hazard. Look into the easy, online forklift training classes with CertifyMe.net. All of our forklift certification programs can be accessed from any device with an internet connection, and all at the pace of the operator. Workers and employers will be 100% OSHA-compliant and able to prevent accidents. Operators will understand not only how to operate forklifts safely, but how to work with forklift extensions properly as well. Create an account and get started today! Online forklift training takes only about one hour to complete and rewards operators with instantly printable certification cards! Are you familiar with OSHA forklift rules? Really familiar? The safety experts at CertifyMe are. In this OSHA forklift rules blog, our team goes into some of the most common – and commonly misunderstood – OSHA safety requirements. OSHA forklift regulations are the “bible” of the most prominent workplace safety agency in the United States. It helps to know exactly what OSHA expects of your company, especially in regards to safe and efficient forklift use. This article reviews some of the most important OSHA forklift rules you should know about, including general requirements, designations, the importance of power supplies & batteries, proper lighting techniques, training program recommendations, loading & unloading, traveling at safe speeds, powered industrial truck operations, and many more. If you’ve ever wanted to firm up your knowledge of OSHA forklift rules, you’ve come to the right place! This post includes plenty of helpful information on forklift safety and operating efficiency. As a forklift operator, it’s your job to be safe on the job, each and every day. That’s not only beneficial for you and your fellow co-workers during your time behind the wheel – it’s also helpful for maintenance workers who inspect your lift, the forklift drivers who are working the next shift, your company’s safety supervisors, and many more. So what can you do to increase efficiency and safety? Our safety experts (who know all about OSHA forklift rules) outline specific tips and tricks you and your company can use today. These include thorough inspections, how personal protective equipment (PPE) impacts forklift safety, proper loading and unloading techniques, safe speed recommendations, checking fluid and battery levels, the importance of measured and steady braking, why idling can be hazardous for your lift and your fellow forklift drivers.